Entries tagged with “Lynton Hall”. Restaurant Review: Tokara’s creative cuisine chemistry is SA’s El Bulli, Richard Carstens our Ferran Adria! El Bulli was the world’s top S.Pellegrino World’s 50 Best Restaurants for a number of years, and its chef/owner Ferran Adria has been saluted as one of the world’s most creative chefs, who closed his restaurant near Roses in Spain for a number of months every year, to try out new recipes in Barcelona. Whilst he will close down his restaurant for an undefined period later this year, he remains a cuisine guru. For Tokara chef Richard Carstens Adria has been an icon chef, and Chef Richard has been following and has been inspired by Adria since 1999, buying Adria’s recipe books that he publishes annually, yet he has never eaten at El Bulli. After an invitation to try out Tokara’s new winter menu on Tuesday, I could not help but associate Tokara with El Bulli, and Chef Richard with Ferran Adria, always searching for a higher level of cuisine creativity. Chef Richard showed me the five volume ‘Modernist Cuisine’, which he bought recently, and is edited by Nathan Myhrvold from America. This chef was an academic wizard, worked for Stephen Hawking and Microsoft, and moved into cuisine, one of his passions. The books document the newest ideas and techniques in cuisine, being modern interpretations of classical cuisine. Chef Richard described the movements in cuisine, from Auguste Escoffier, to Nouvelle Cuisine, to Deconstruction (now renamed Techno-Emotional, Chef Richard told me!) led by Adria, to Modernist Cuisine. 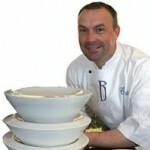 Adria was the first chef to blur the definition between savoury and sweet, by creating savoury ice creams, for example. I visited Tokara just after Kuhn and Carstens took over Tokara in October last year, and it was good to see that there were familiar waiters from then, and from Jardine, which Kuhn closed down in February. It being a cold wintry day, I was happy to sit at the table close to the massive fireplace. In the past few months the restaurant has had a make-over in terms of a new carpet, softening the sound in the room and the interior, and the chairs have been upholstered in an attractive blue fabric. Each of the chairs has the name of a wine cultivar on it, bringing the wine estate into the restaurant. New lights have been added too. Wooden tables and chairs fill the restaurant, and I liked the design of the half-round tables placed against the glass doors, seating couples. There is no table cloth, but material serviettes, Eetrite cutlery and good stemware. The Tokara tasting room is in the same building, a large room with a massive fireplace, that was buzzing with tasters. The cloakrooms are shared with the tasting room, and are a modern combination of stainless steel basins set in wood. In the tasting room a specially designed William Kentridge drawing for his “The Magic Flute” opera and Tokara wine series hangs over a display of Tokara wines. In the restaurant a Kentridge tapestry called ‘The Porter and the Bicycle’, inspired by the Second World War and hence the map of Europe forming the background to the tapestry, Manager Johan Terblanche explained, dominates the interior, the only artwork in the main restaurant. It was specially made for Tokara owner GT Ferreira. A Jacqueline Crewe-Brown painting is in the second room, and a second is to come. Art is an important part of Tokara Winery, and they regularly exhibit art made from wine. An extensive collection of art is displayed in the passages leading to the restaurant and tasting room, and even in the cloakrooms. At the entrance to the building, a fascinating tree-shaped ‘sculpture’ attracts attention, a modern statement of what is lying inside the building. Chef Richard came to welcome me at the table, and had prepared a special 10-course menu of small dishes to try, consisting of some of the starters, main courses and desserts on his new winter menu. He told me that he and his team try to take the menus one step higher. He invited me to come to the kitchen at any time, to see him and his team prepare the dishes, which offer I took up, and immediately another little dish of smoked salmon ice cream topped with caviar and served with a colourful citrus salsa was made for me to try. After the restaurant re-opens after a week’s break from 2 – 9 May, a Chef’s Menu will be introduced, consisting of three courses plus an amuse bouche and a palate cleanser, at an excellent price of R 225 (their 8-course degustation menu cost R400 in summer). Staff look neat in white shirts and black pants. They exude efficiency and all are knowledgeable about Chef Richard’s dishes, one needing a good memory to remember all the ingredients that make up his masterpieces. Even Jaap-Henk Koelewijn, the sommelier, was perfectly at ease in explaining what was in the dishes that he brought to the table, helping the waiter Ivan on occasion. I made Jaap-Henk’s job difficult, in limiting my wine drinking over lunch, and stating my preference for Shiraz. He started me off with a Tokara Zondernaam Shiraz 2009, and told me that the ‘Zondernaam’ will be phased out in future vintages, due to the improved quality of the winemaking, and all wines will be marketed under the Tokara name in future. The wine was chilled to 16°C, quite cold for a red wine I felt, but Jaap-Henk explained that a colder temperature helps to temper the tannins in a red wine. This was followed up with a Sequillo Shiraz and Grenache blend, made by Eben Sadie. I started with a beautifully presented and colourful hot butternut soup, thick and creamy, and served in a glass bowl, to which Chef Richard had added a smoked snoek croquette, which gave the soup an unusual distinctive taste. To this he had added shaved almonds and salted apricots, and drizzled it with coriander oil. On the winter menu this starter costs R60. This was followed by a calamari risotto, and its lemon velouté came through distinctly to enhance the calamari. It costs R65 as a starter, and was decorated with rice crisps and toasted brioche that had been dyed black with squid ink. A beautiful autumn-inspired dish contained beetroot, and leek which had been dyed a reddish colour using beetroot juice. It contained a number of interesting ingredients, including a Gewürztraminer-poached pear, gorgonzola balls, a ball each of yellow pepper and beetroot sorbet, pear compressed into small squares, and hazelnut. This starter costs R65 on the winter menu. Another starter dish, costing R75 on the winter menu, was a chicken, crisp pancetta and prawn stack, served with an egg prepared at 62°C to get the white of the egg to set whilst keeping the yolk runny. It also contained almonds, and was served with a Spanish Sofrito smoked paprika sauce. This is a cold starter. So too was the starter of fig, teriyake glazed tofu, goat’s cheese, orange slices, hazelnuts and a tatsoi sauce. This starter does not appear on the winter menu, but was very popular on the summer menu, Chef Richard said. A palate cleanser of rose geranium sorbet (surprisingly white but tasting heavenly, more subtle in taste than that at Dash restaurant) and a pickled ginger sorbet (surprisingly pink) was a refreshing break on my culinary journey. The first main course was a herb-crusted rainbow trout served on mash and wilted spinach, courgette and pine kernels, with a lovely violet beurre rouge, which costs R120 as a main course on the winter menu. As the eighth course, I could not finish all of the peppered springbok, which Chef Richard said he sources from Graaff Reinet, and this is one of his best sellers, costing R155. It was served on parsnip purée, with beetroot and croquettes, decorated with slices of plum, and served with an hibiscus jus. The desserts were too delicious to refuse, and I had a wonderful strong cappuccino (R20) made from Deluxe coffee with each. The first dessert had no colour at all other than white, unusual given Chef Richard’s colourful dishes that had preceded the desserts. It consisted of a refreshing lemon mousse, mascarpone mousse, white chocolate sorbet, pieces of white chocolate and of meringue, and an almond financier, a type of sponge, cut into blocks. It costs R50 on the winter menu. The final course was a dessert (R55) made with hazelnut ice cream, pistachio sponge, aerated chocolate, coulant (a mini chocolate fondant), honeycomb and hazelnut streusel. As if there was not enough food already, the cappuccino was served with a coconut chocolate and two mini-meringues held together with chocolate. The winelist and the menu are both presented in beautiful small black leather-covered holders, with the Ferreira family crest on them. The winelist states that BYO is not allowed. Cigars and cocktails are offered, as are 100 wines. Wines by the glass include Colmant Brut (R55/R290), Graham Beck Brut Rosé (R85/R430), Pol Roger Brut (R180/R890), and Sterhuis Blanc de Blanc (R50/R250). Seven red wines are offered by the glass, ranging from R60 for Hartenberg Merlot 2008 to R125 for Raats Cabernet Franc 2008. Tokara Zondernaam Cabernet Sauvignon (2008) and Shiraz (2009) cost R35. Ten white wines by the glass include seven Tokara ones, including Sauvignon Blanc and Chardonnay, ranging in price from R25 – R55. Billecart Salmon Brut Rosé costs R1500, its Elisabeth Salmon 1996 R3000, and its Clos Saint Hilaire 1998 R7000. Steenberg 1682 Brut costs R290. Five Shiraz choices are offered, starting at R135 for Tokara Zondernaam 2009, to R1400 for Hartenberg’s Gravel Hill 2005. French wines dominate the imported wine section, with 38 choices, ranging from R600 for Château Margaux 1996, to R8500 for two wines: Chambertin Armand Rosseau 1995, and Le Musigny Comte George de Vogue 1995. The only downside of the lunch was the number of noisy children running around, despite the menu not catering for children at all – half-portions of the linefish of the day and of steak are served with chips for children. I was impressed with the tolerance and patience shown to the children by the waiters, when stepping into the fireplace, for example. Chef Richard Carstens is a definite Eat Out Top 10 Restaurant contender for 2011. He is constantly reinventing himself, not happy to just stay with one cuisine style, but looking to challenge himself and his menu regularly. He is hungry for new knowledge and inspiration, finding it in music, in fashion, in nature, and in books. His food is colourful, and incredible attention is paid to creating a dish consisting of a number of unusual elements, many of them having undergone prior work to add to the palette on the plate. When I first visited the new Tokara in October, Chef Richard sent out a carpaccio as an amuse bouche, and my son and I struggled to identify what it was made from, having quite a wild taste – we could not believe that it was made from watermelon, an idea that he had picked up from Mugaritz, now third ranked on the S.Pellegrino World’s 50 Best Restaurants, but that he had executed completely differently. Chef Richard has a passion for his craft, commendable from a chef who has been around for longer than most in the Cape, and it shows in his creative cuisine. I felt very privileged to have been invited by him to try his new winter menu. Tokara Restaurant, Tokara Winery, Helshoogte Pass, Stellenbosch, Tel (021) 885-2550. www.tokararestaurant.co.za (The website is disappointing for a top restaurant, only containing the address, telephone number, and Facebook and Twitter links. There is no menu, no winelist nor Image Gallery. Twitter: @Tokara_ @RichardCarstens. Tuesday – Sunday lunch, Tuesday – Saturday dinner. It’s been confirmed! Six-time Eat Out Top 10 Restaurant Chef Richard Carstens is to be the Executive Chef of a new improved Tokara restaurant in October, after a week in which the rumour circulated, was denied by the Tokara Ferreira family, and was finally confirmed by a media release on Friday. The move creates a culinary hub in the Helshoogte Pass, with the two Delaire restaurants across the road, and the Pass being a link between the competing gourmet towns of Stellenbosch and Franschhoek, and adds further weight to Stellenbosch now wearing the Gourmet Capital crown and for it to establish a Restaurant Route. Tokara restaurant has been an institution for the past ten years, and was vacated by Chef Etienne Bonthuys last weekend, as he is opening a restaurant on Dorp Street in Stellenbosch. Bonthuys has not always been the easiest of chefs and restaurant owner, so new owner Wilhelm Kuehn, co-owner of Jardine’s in Cape Town, will have to rebuild the brand to attract new patrons, whilst retaining the Bonthuys regulars. Kuehn plans to build the Tokara restaurant to be on a par with the highly regarded Tokara wine and olive oil product brands, to create synergy between the three entities. Carstens is not known for his long-term staying power at restaurants (the exception being his five year tenure at Lynton Hall), but Kuehn says he is hoping for a long-term relationship with his new chef. The media release states that Tokara Restaurant will be focused on contemporary cuisine. “Each plate of food will offer the diner a sense of the natural environment and the location of the restaurant as well as the current season through the ingredients used”, says Carstens. The menu contains “unfussy a la carte options as well as a more playful tasting menu, each course optionally paired with a glass of Tokara wine or a selection of other premium South African wines”. There will be no molecular gastronomy at Tokara, a distinctive Carstens’ trademark, but not appreciated by all. A bar will be built in the foyer, from which one can enjoy the wonderful views onto the Tokara vineyards and onto Stellenbosch. Asked about the future of Jardine’s in Cape Town, Kuehn said that nothing will change. Eric Bulpitt is their Executive Chef, who is off to a 6-week stint at Noma, the world’s top of the 50 Top Restaurants list, until mid-September. 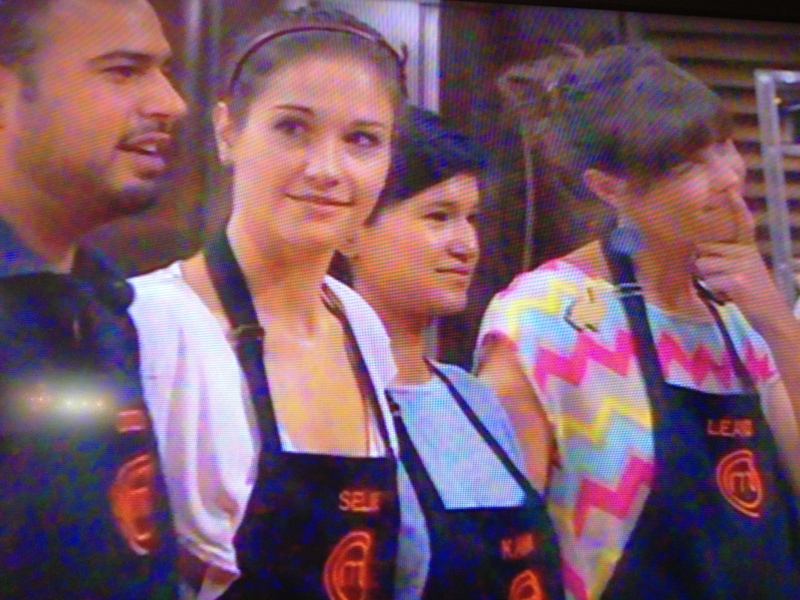 Sous chef Julie will hold the kitchen fort at Jardine’s in Cape Town. A manager will be appointed for the Tokara restaurant. George Jardine has no involvement with Tokara at all, and still is a co-owner of Jardine’s in Cape Town, although his focus is Jordan Restaurant with George Jardine in Stellenbosch, said Kuehn. Richard Carstens is contracted to Chez d’Or in Franschhoek until September, but the association is a disappointing one. Read our review. Tokara Restaurant with Richard Carstens will open in October, serving lunch from Tuesdays – Sundays, and dinner from Tuesdays – Saturdays. Tel (21) 808-5959. On the Stellenbosch Restaurant Route. POSTSCRIPT 1/8: Richard Carstens left Chez d’Or on Wednesday, the day of our review, two months ahead of his contract ending with the Franschhoek restaurant. Restaurant Review: Chez d’Or is a Carstens compromise! I decided to try the new Chez d’Or restaurant on the main road in Franschhoek for lunch, after the 60th birthday concert on Sunday of well-known potter David Walters in the NG Church, diagonally across the road. I had read in the local rag ‘The Franschhoek Month’ that six-time Eat Out Top 10 chef Richard Carstens had opened the restaurant, which led me to believe that he was the new owner of the restaurant. It was a massive disappointment and let-down. Previously low key Cafe Rouge, which was set back in Bijoux Square, making it hard to see, the new restaurant has been brought forward and expanded in this Square, in the space in which the optometrist was previously located. Owner Jason de Jongh has re-invented the restaurant completely, with the larger space, more upmarket interior design, changing the restaurant name to bring it in line with his guest house name (Val d’Or), and bringing Carstens in on a three-month consultancy contract only (not mentioned in the article). Carstens is the South African ueber-chef, who indulges in foams, is a good trainer of staff, and is good at helping set up new restaurants, but has had little staying-power (except at Lynton Hall, where he worked for five years). Jason explained that he wanted to create a Bistro-style restaurant, with Carstens’ input, but without the type of cuisine Carstens has become known for, so as to not create a huge difference in the quality of the food served after Carstens leaves the restaurant in September. Carstens is quoted in the article as saying about the restaurant: “Its a classic yet contemporary bistro with Asian influences”. The red and white tablecloths with white overlays create the Bistro look. The cutlery is neatly wrapped inside the serviette, probably a Carstens’ touch. The problem with the restaurant and Carstens’ connection was immediately evident when the hardboard menu started with a list of sandwiches! These are served between 11h00 – 17h00, and are quite expensive, in ranging from R 45 for an aubergine, mushroom, pepper, coriander pesto and gruyere sandwich, to R58 for a ribeye and aioli or smoked salmon sandwich, and a beef burger. A further problem was that Carstens explained some of the menu items but not all – the Carstens touch shows when he described the Soup of the Day (the waitress just called it a Butternut Soup). Carstens described it as a Butternut Soup served with almonds and snoek, changing its nature completely, snoek not being to everyone’s taste. The spiced tomato, coconut, lime and chilli sorbet soup sounded delicious too. The wholewheat bread did not look home-baked, and in fact seemed to show its age with first signs of mould, so we did not eat it. The butter was untidily cut and presented. Other starter choices are spiced calamari (R58), duck liver pate (R52), smoked rainbow trout (R65), chicken spring roll (R47), and a mushroom and artichoke salad (R45). The Pork belly (R85) was served on a tiny portion of mash with butternut, the black eggplant puree looking unattractive in the brown (with green oily bits) mustard sauce. Overall, the plate of food looked unattractive, and the pork had an odd taste. My son’s Ribeye steak(R98) was ordered medium rare, but was prepared more to the medium side. It was tender, but the chip portion was tiny, so the waitress brought more, without extra charge. The spinach was tender and tasty. The Tempura linefish (R80) was kingklip. Other main courses are Duck leg (R85), Asian braised lamb shank (R98), and Beetroot and aubergine curry (R70). The winelist is on the reverse side of the menu, and will not feature on the Diner’s Club Winelist of the Year awards list. It is simply divided into “Methode Cap Classique Sparkling”, White Wine, Rose Wine, Red Wine and Dessert Wine/Port and is commendably Proudly-Franschhoek in its wine selection, with the exception of the Landskroon and Quinta Do Sul Vintage Reserve ports. Each wine is described in brief, but no vintages are listed. The wine-by-the glass prices are so low (R18 for Porcupine Ridge Viognier/Grenache, Haut Espoir Sauvignon Blanc R20, Eikehof Cabernet Sauvignon R18) that one wonders how young they are, and whether they are drinkable. The Haute Cabriere Pinot Noir is the most expensive wine on the list, at R250, but most wines are under R200, making the wine choice affordable. We skipped the starter to leave space for Carstens’ signature dessert, which is not on the menu – frozen dark chocolate mousse served with saffron ice cream on biscuit crumbs, with mint sauce. The dessert sounded better than the real thing, which were four unequally cut blocks of frozen chocolate mousse. The saffron ice cream and mint sauce were delicious. Other options are an interesting sounding Gin and lemon tart (R40); Poached banana ice cream (R38); Vanilla creme (R38); Chocolate tart, cardamom ice cream with pear (R50); and a Cheese board (R65). We left Chez d’Or bitterly disappointed, in having expected Richard Carstens’ quality but getting a most unsatisfactory meal, even though he was in the kitchen! Anyone who would think of coming to eat at the restaurant, on the basis of Carstens’ association with it until September, should not eat here. I felt cheated, as I could not sense Carstens’ hand here at all. Carstens is rumoured to be taking over the Tokara restaurant when his consultancy contract at Chez d’Or comes to an end in September, but Tokara is denying this. Chez d’Or, Bijoux Square, 60 Huguenot Road, Franschhoek. Tel (021) 876-4197. www.chezdor.co.za (The website is disappointing, with only a Home page, giving contact details and a restaurant interior shot, no menu or winelist). Monday – Sunday. Lunch and Dinner. POSTCRIPT 30/7: It has been confirmed that Richard Carstens will be the Executive Chef of Tokara Restaurant, in conjunction with Jardine’s Wilhelm Kuehn, from October. POSTSCRIPT 1/8: I have been informed by Wilhelm Kuehn, the new operator of the Tokara restaurant, that Richard Carstens has left Chez d’Or. The Chez d’Or staff confirm that he left on Wednesday, the day of our review, and that he left ahead of the end of his contract. We were clearly told by the owner that he would be at the restaurant until September. Franschhoek goes to Cape Town! Well-known Franschhoek tapas restaurant Bouillabaisse is to open a sister restaurant in the new Epicurean Food Emporium in Cape Town next month. Chef and owner Camil Haas previously owned Klein Oliphantshoek, the guest house at which he and his wife Ingrid prepared award-winning tasting menu meals for their guests. Not only will a new Bouillabaisse open in Cape Town, but a new restaurant Crepe Suzette will also be opened by the Haas duo. The Epicurean Food Emporium has been designed by Conrad Gallagher Consulting, and will open in The Rockwell, an apartment building in De Waterkant. It will be set up as a neighbourhood food market, with 15 food and beverage stores selling freshly baked bread, homemade jam, chutney, pesto, olive oil, wine, gourmet sandwiches, chocolates, ice cream, confectionery and cheeses. It is to become a one-stop market synonomous with fine food, outstanding service, quality and food trends, reports Supermarket & Retailer. Further restaurants, in addition to Bouillabaisse and Crepe Suzette, are set to open. Other restaurant news is that onewaterfront, the restaurant in the Cape Grace Hotel in the Waterfront, which became famous when Bruce Robertson was the chef, is changing its name to Signal, reports eatout, in honour of Cape Town’s traditional noon day gun on Signal Hill. The restaurant will serve Cape food, reflecting the French Huguenot, British, Dutch and Asian heritage of the Cape. Bruce Robertson, now the owner of award-winning and Top 10 restaurant The Showroom, is opening another restaurant, located in the Grand Daddy Hotel, previously The Metropole Hotel, in Long Street, called theshowroomcafe, reports eatout. The menu will be casual, local and “unfussy”, and the chef is Simone Rossouw. Richard Carstens, top 10 restauranteur when he was at Lynton Hall in KwaZulu-Natal and Bijoux in Franschhoek, is not moving to Franschhoek, as speculated, but is relaunching Relish in New Church Street, and is now called Nova, reports eatout. A tasting menu (at R 325 per person) and an a la carte menu will be offered. Despite the depressed economy, the restaurant industry appears to be confident about the future, with a number of new restaurant openings. The first restaurant to open is the re-awakened Roundhouse in Camps Bay, once the site of one of Cape Town’s finest restaurants. Owner Fasie Malherbe proudly brags that his restaurant will become the best in Africa! He is unashamedly Proudly Capetonian, and states that he only wants locals to support his restaurant – he is not interested in tourists. Also owner of the training company Let’s Sell Lobster, which has just been contracted by Wines of South Africa to train 2010 winestewards to deliver excellent service, Malherbe recently supported his GM’s rudeness, on the basis that his shareholder interests were being protected! Franschhoek already is the Gourmet Capital of South Africa, with three of the country’s Top Ten restaurants located in this beautiful village. Competition is set to increase, with three new restaurant openings. Richard Carstens is said to be opening on Huguenot Road, not far from the Monument, in a newly renovated Victorian Cottage. Carstens was a Top Ten chef when he headed up Bijoux in Franschhoek about 5 years ago, and continued wearing the Top Ten chef crown when he left Franschhoek for Lynton Hall near Pietermaritzburg. A stint at Manolo in Cape Town followed, but ended before it had really got going. Carstens may not be opening in Franschhoek after all, given an alleged fall-out with landlord Trevor Kirsten. Bertus Basson is cooking up a storm at his restaurant Overture on the Hidden Valley Estate in Stellenbosch, and will turn up the heat in Franschhoek when he opens his restaurant Genot on Kleingenot in December. Ever evolving Solms Delta is opening its new restaurant Fyndraai in the season. Reubens has undergone a make-over and expansion, and newly married Maryke Riffel is back on the floor, welcoming patrons. Camps Bay too will see a further four new restaurants opening this season, with the Grill House, an Indian restaurant and a Paranga Bar opening below Blues. The Grand Cafe will open in the Opium location, as a restaurant well-known to the Plettenberg Bay jetset for its simple yet yummy menu and exceptional music. The Grand in Plettenberg Bay was the brainchild of Gail Behr, who has since sold her Grand Cafe and Rooms. The Grand in Camps Bay will also offer accommodation.